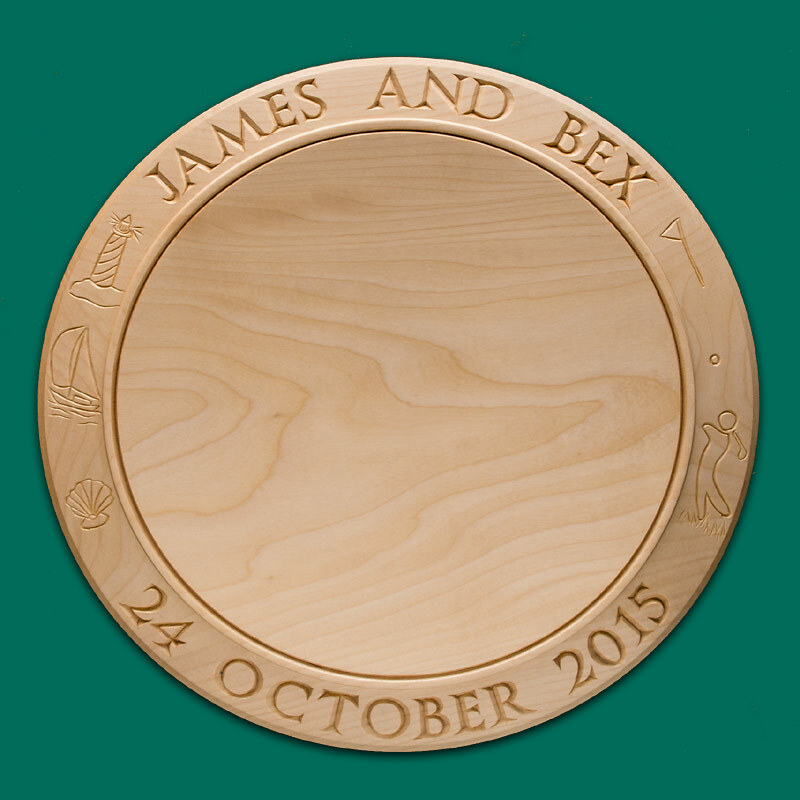 Large cheese boards are starting to be requested more often these days and I usually make them 14” (36cms) wide but can go wider still especially for couples having a "Cheese Wedding". 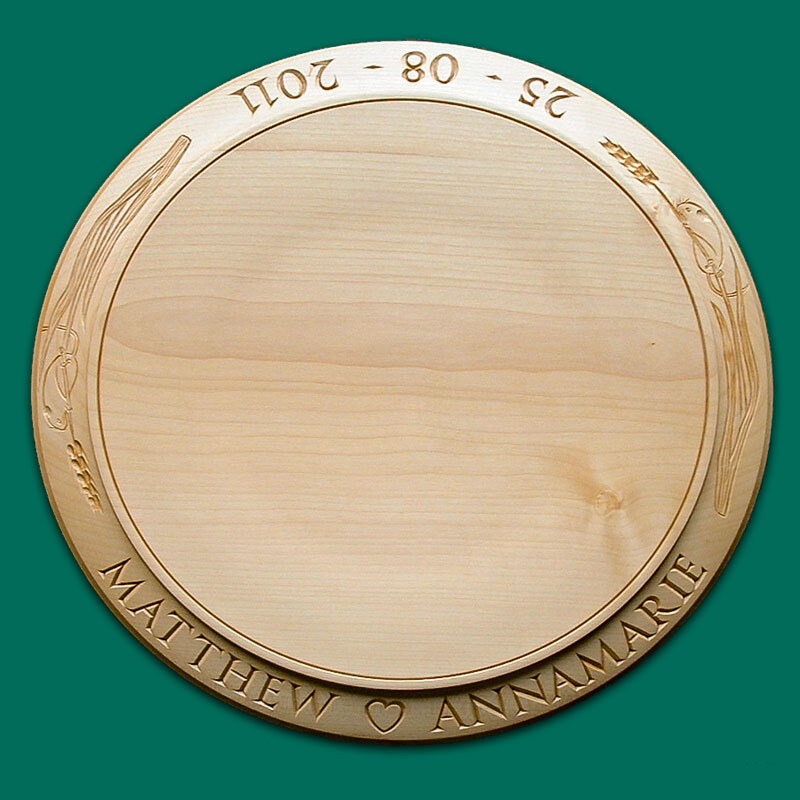 Instead of a crumb ring which is the deep channel you see on a breadboard, I put a thin decorative v groove which sets the board off and is pleasing to the eye.The cheese board can be personalised with whatever inscription you like. 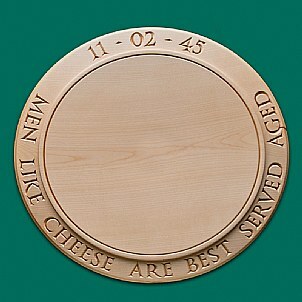 If there isn't enough room for a long inscription on the front I can continue on the back of the cheese board. 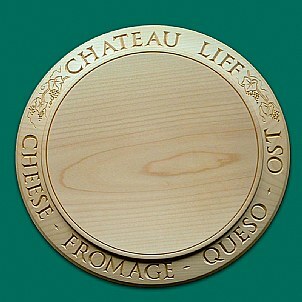 A 14” board is a good size and allows you to get quite a lot of cheese on it. An ideal centerpiece at a party. Side decoration is usually free unless it's very complex. Insured carriage is £12.95 in Uk. It's very difficult to set up an order system for these, so please contact me to discuss your requirments. 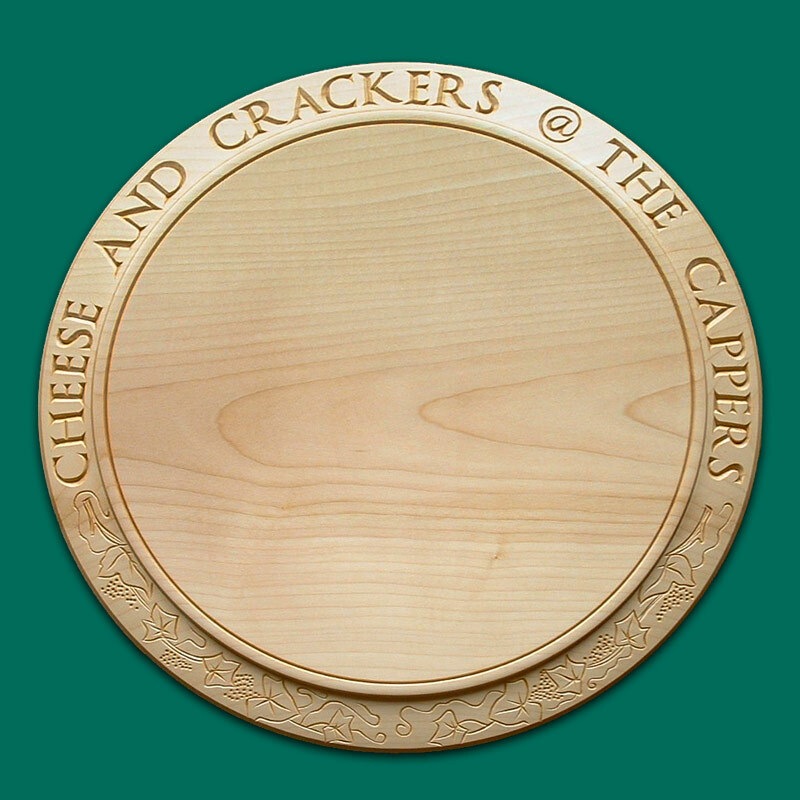 This cheese board was commissioned for a Wedding, I engraved trailing Grapevines either side. 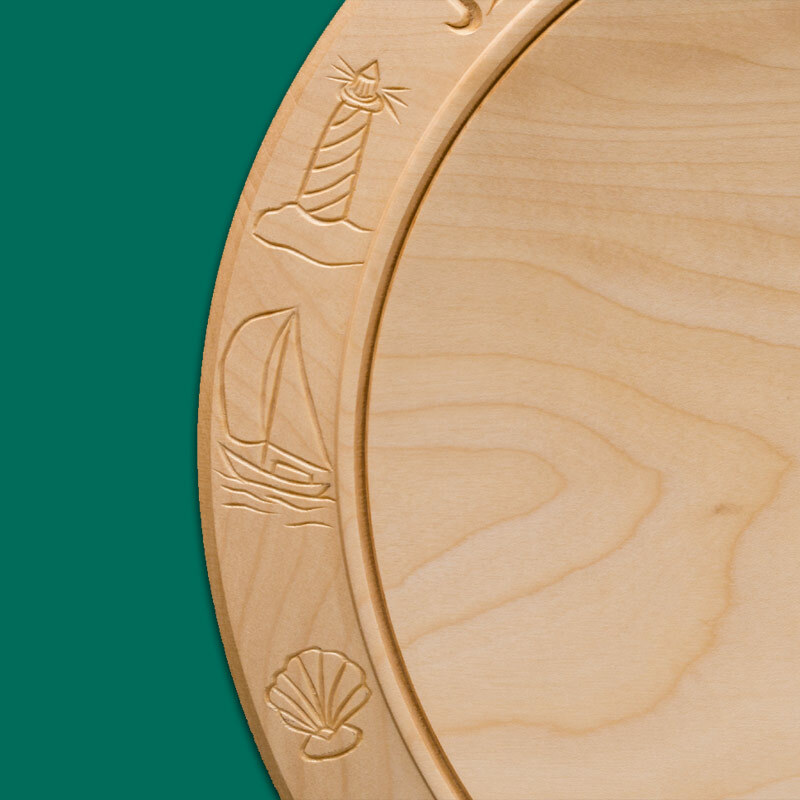 Another Wedding cheese board; the happy couple enjoy sailing and playing Golf, and so I was asked to decorate it appropriately. 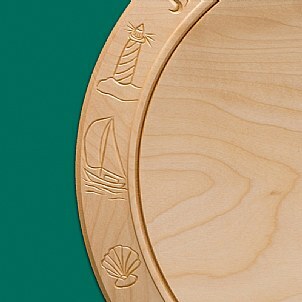 Closeup of a marine theme. I thought a lighthouse,yacht, and a shell would do the trick. 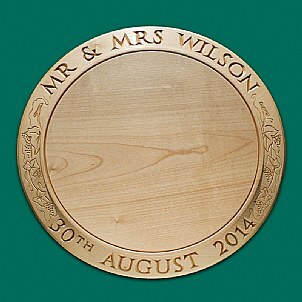 The customer was delighted. 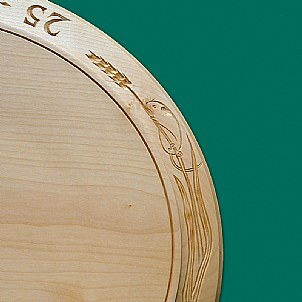 Closeup of a Golf theme. 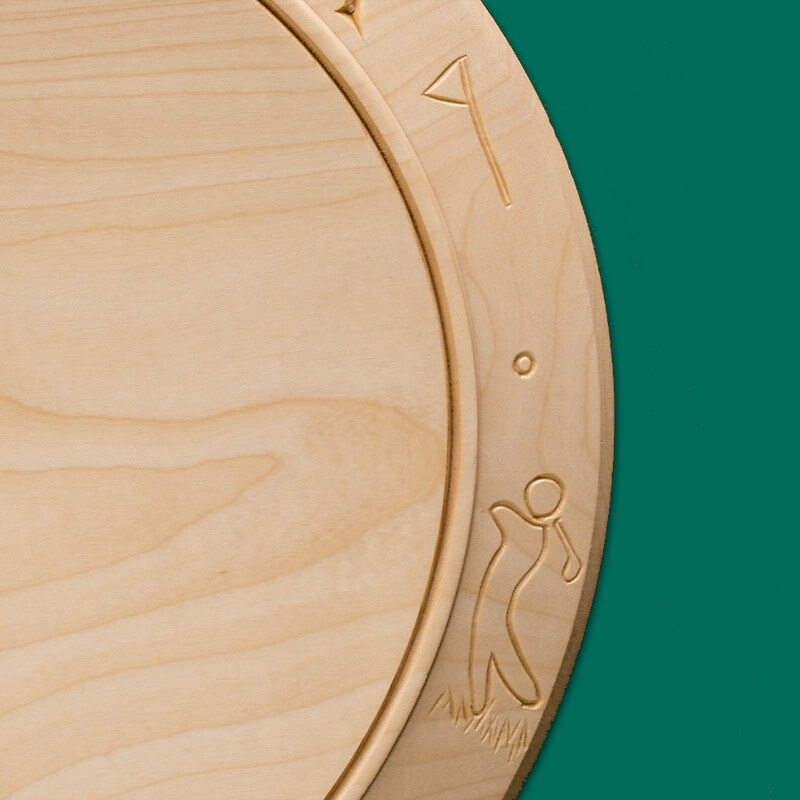 There's not much room for a complex engraving, so this simple Golfer fits the bill. The grapevine decoration really sets off Mr and Mrs Wilson's cheese board. 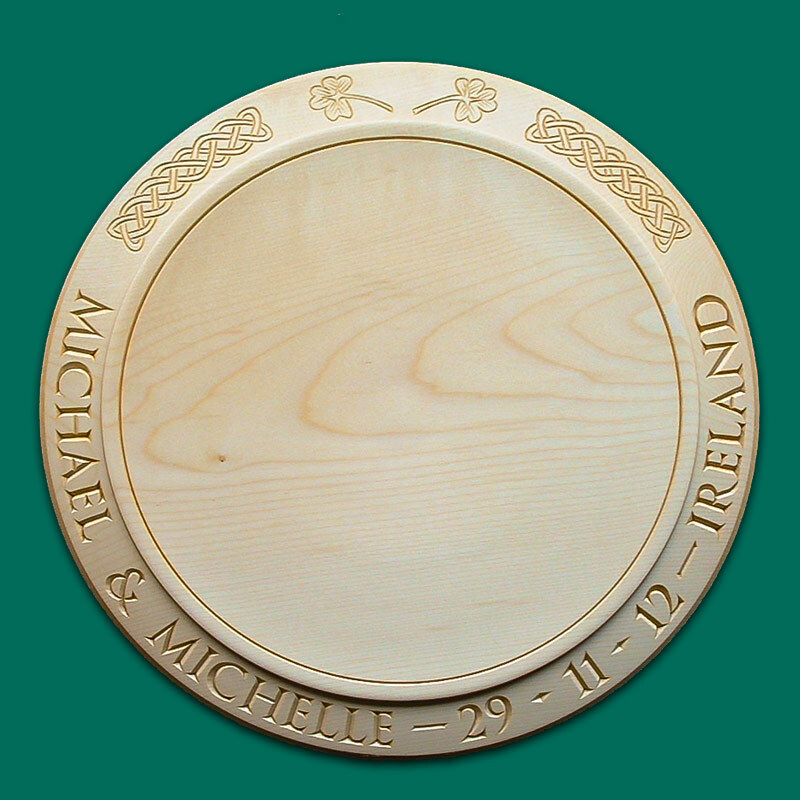 This 14" Wedding cheese board is decorated with Celtic knot-work and Shamrocks. 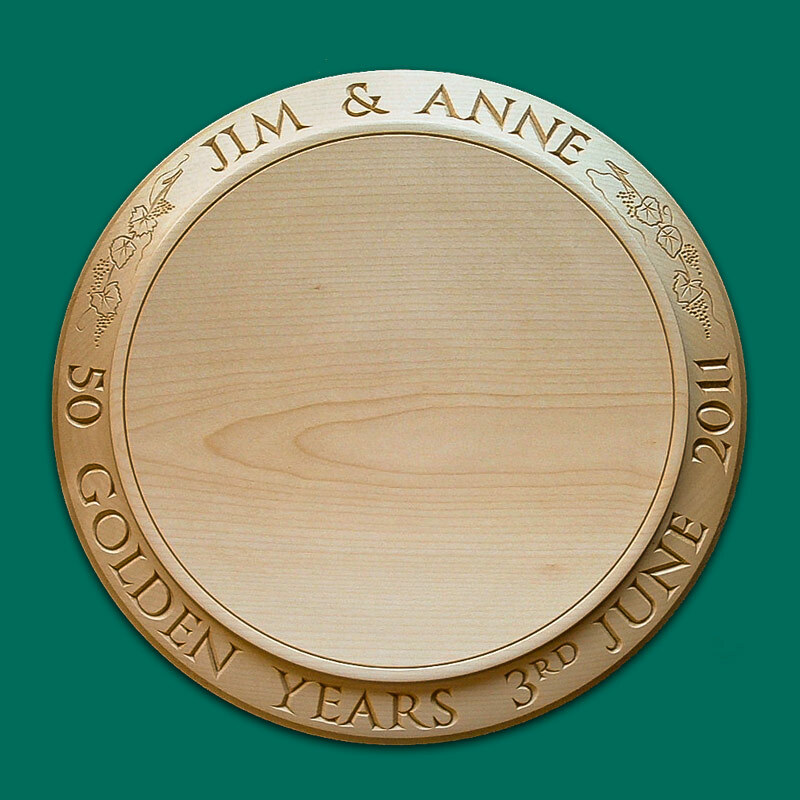 Jim and Anne celebrated "50 Golden years" in 2011. I tried to pick a cheese board that had a deep golden colour. 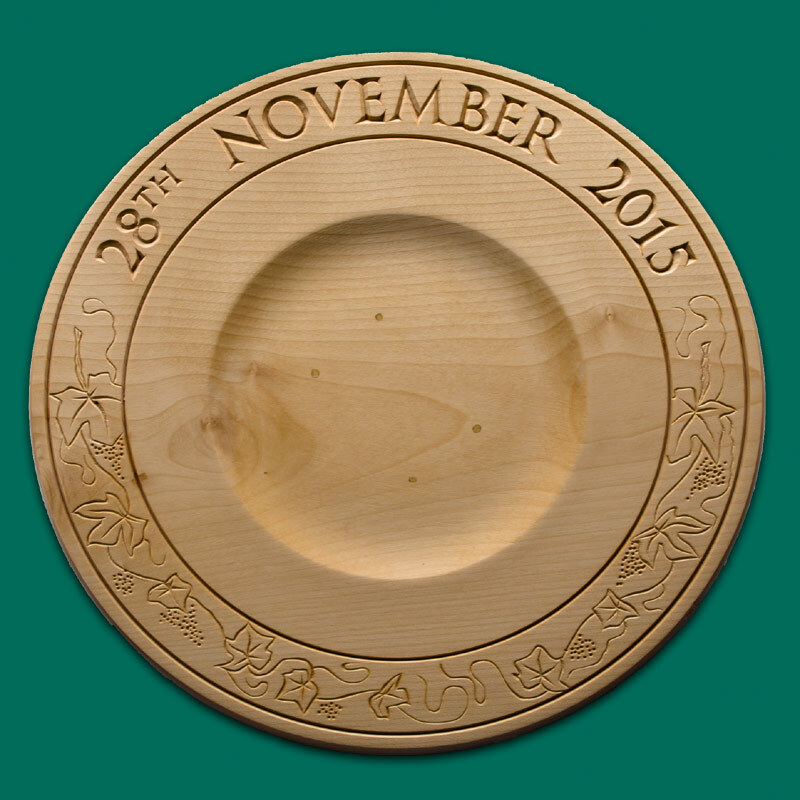 This board is 16" across and I'm sure will look wonderful at a wine and cheese party. Big Birthday celebration cheese board. 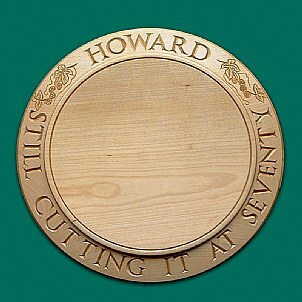 In my opinion the use of some punctuation would have made it easier to read; but the Customer is always right! 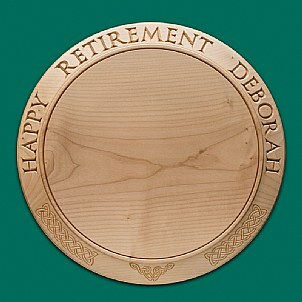 This 14" cheese board was a gift from Deborah's friends and colleagues. 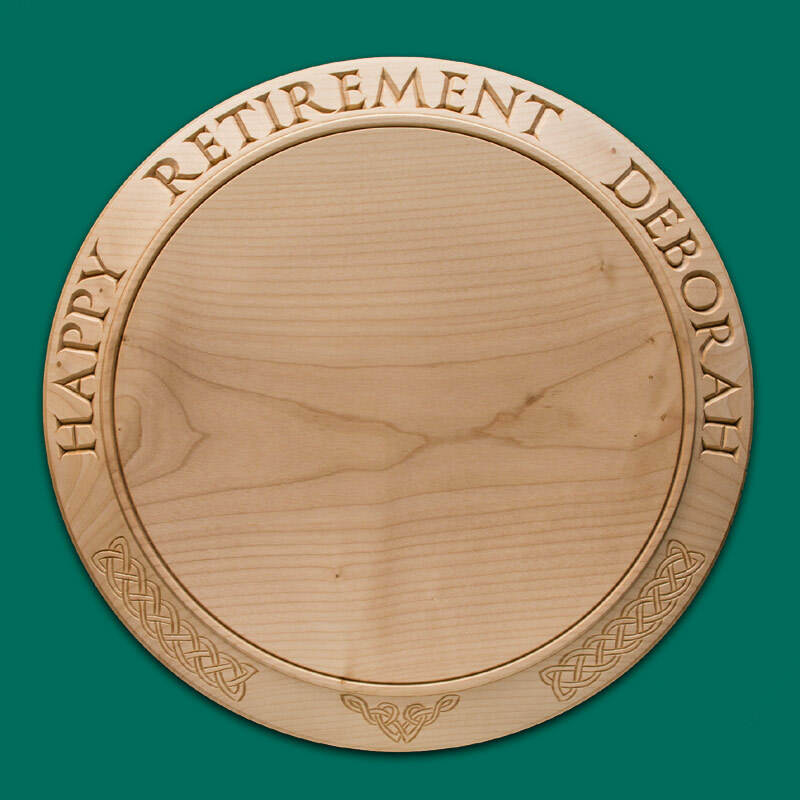 I was asked to decorate it with Celtic Knot-work. Cheese board for a French Chateau. 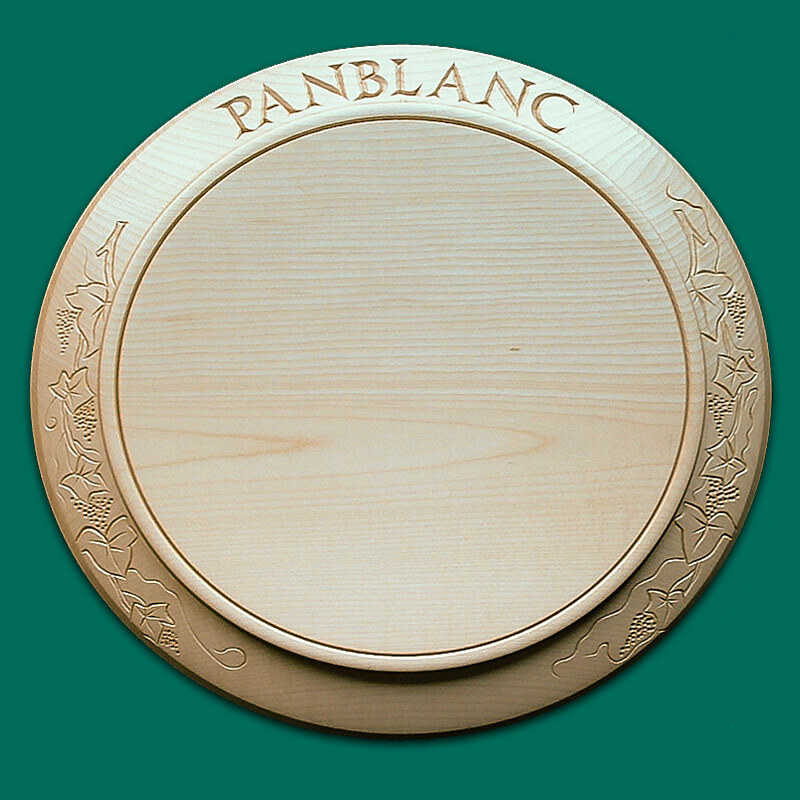 This multi language cheese board has the word for "cheese" in French, Spanish and Norwegian as well as English. It has a very special significance to the family. This board was destined for France. Trailing grapevines seemed the most appropriate decoration. 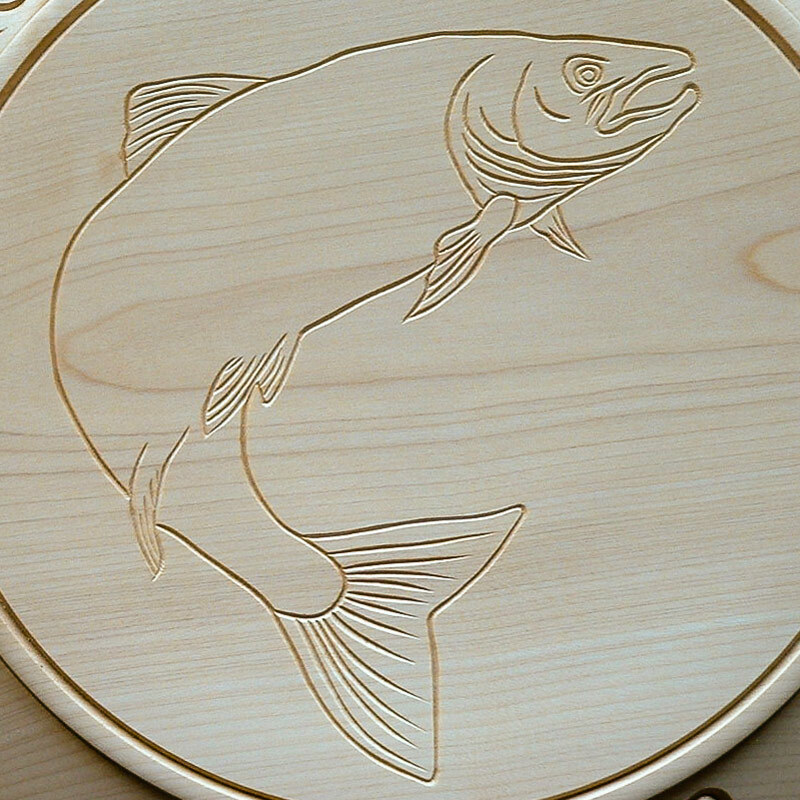 12" cheese board decorated with Hops. 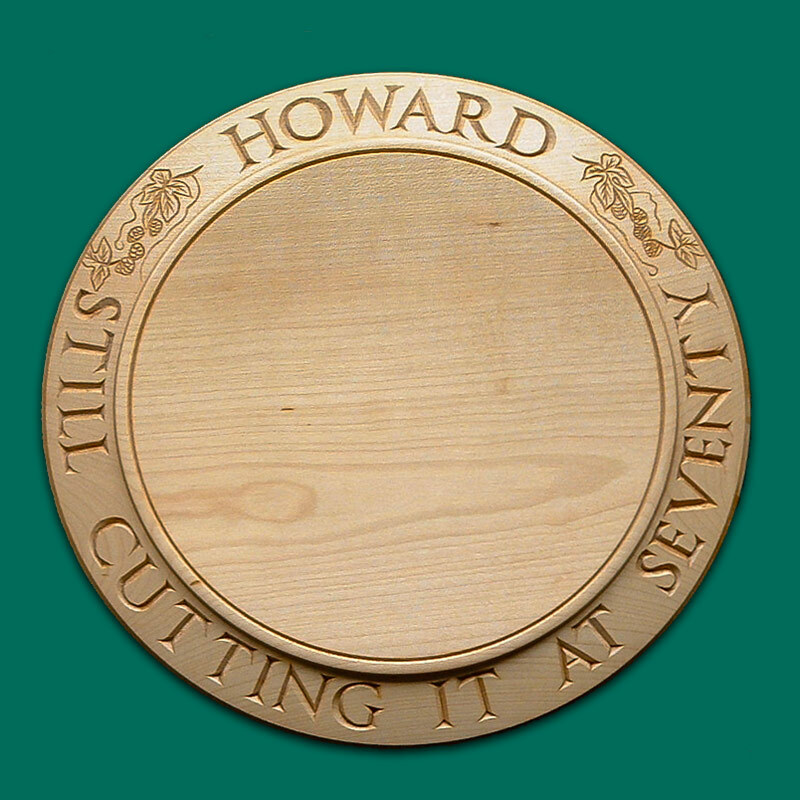 Howard celebrates his 70th birthday! 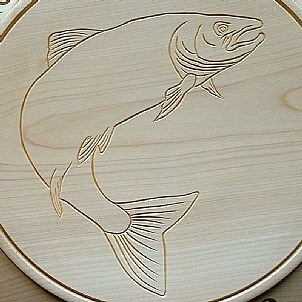 As he likes a beer I engraved Hops to decorate the board. 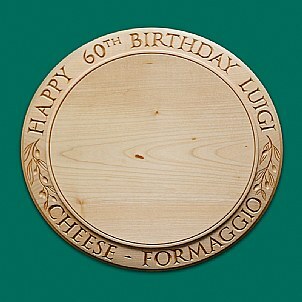 As Luigi is from Italy I was asked to carve "Formaggio" and decorate the cheese board with Olive branches. 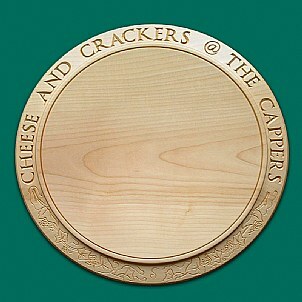 16" cheese board for a "cheese Wedding"
This 16" board was commissioned for a "Cheese Wedding" where the couple have a tiered "cake" which is made up of several sized cheeses. The wedding had a "harvest" theme and I was asked to decorate the cheese board with a Harvest Mouse climbing a stalk of wheat. 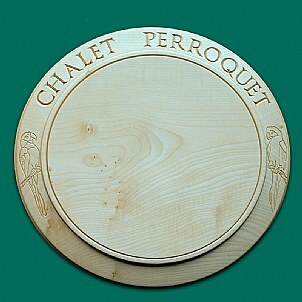 Cheese board for a French ski Chalet. This 14" cheese board was commissioned as a gift for people who run a ski chalet in France. 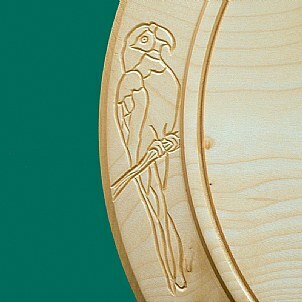 Parrots were requested to decorate the sides. 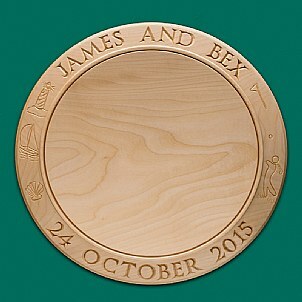 I had to charge a little extra to engrave the Parrots as they took a wee while. 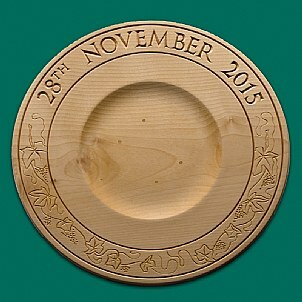 The recipients of the gift were delighted with it and use it to serve cheese to their guests. This was presented to an employee of a Salmon farm who retired after 23 years. 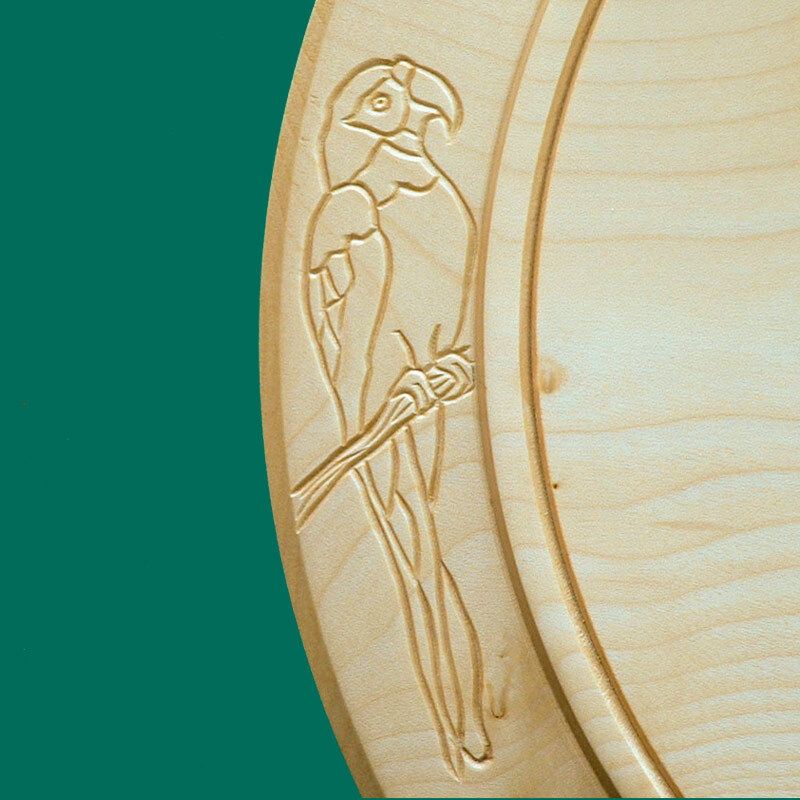 The company logo was engraved on the centre of the cheese board. 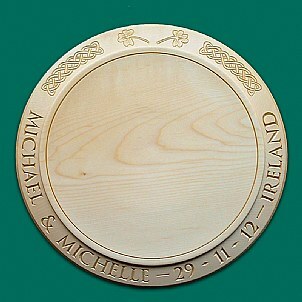 I do have to charge a little more for the centre engraving; the cost depends on how complex it is. 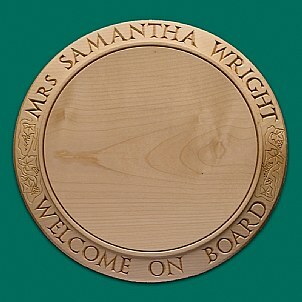 A personalised cheese board to welcome a new member into the family. 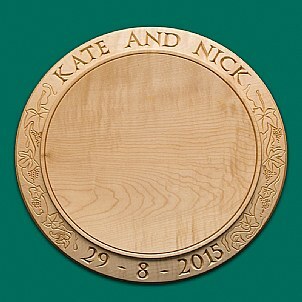 This is the back of the board which I decorated with trailing Grapevines. 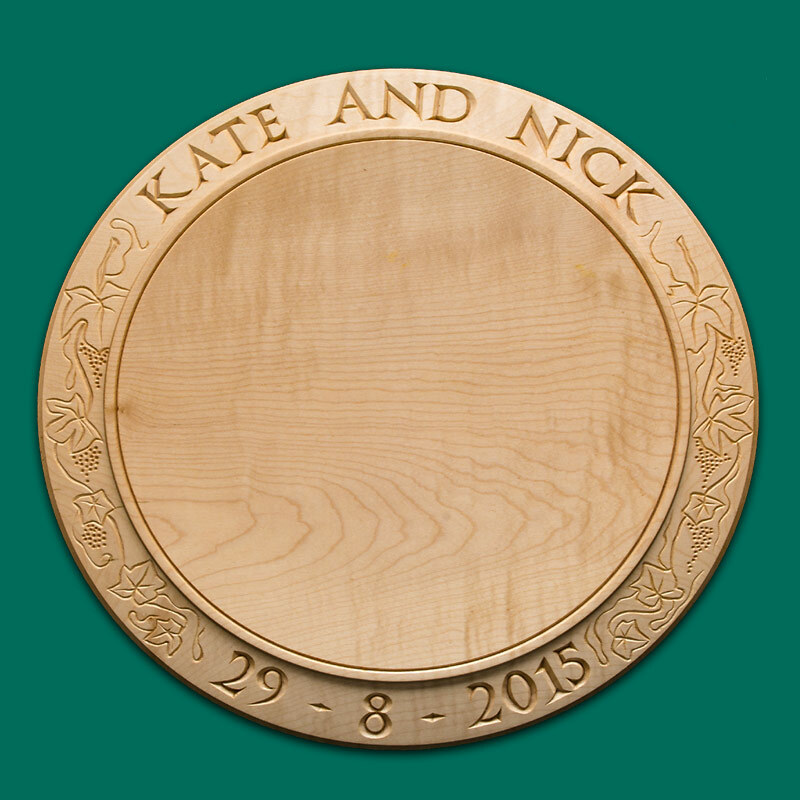 The cheese boards are all turned from a single piece of Sycamore. 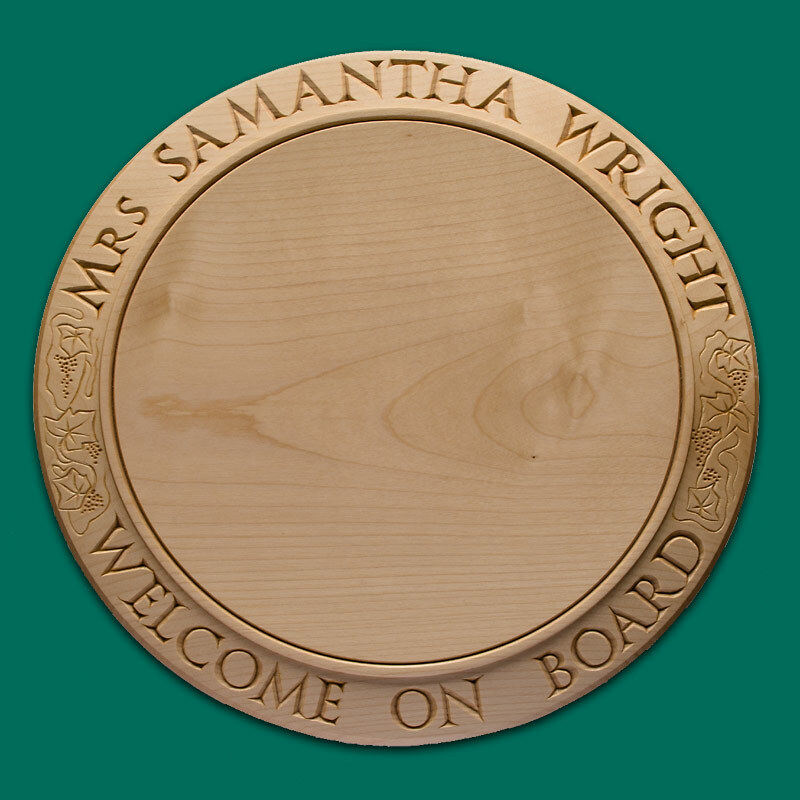 Your personalised inscription is then hand carved onto the board using traditional methods and tools. 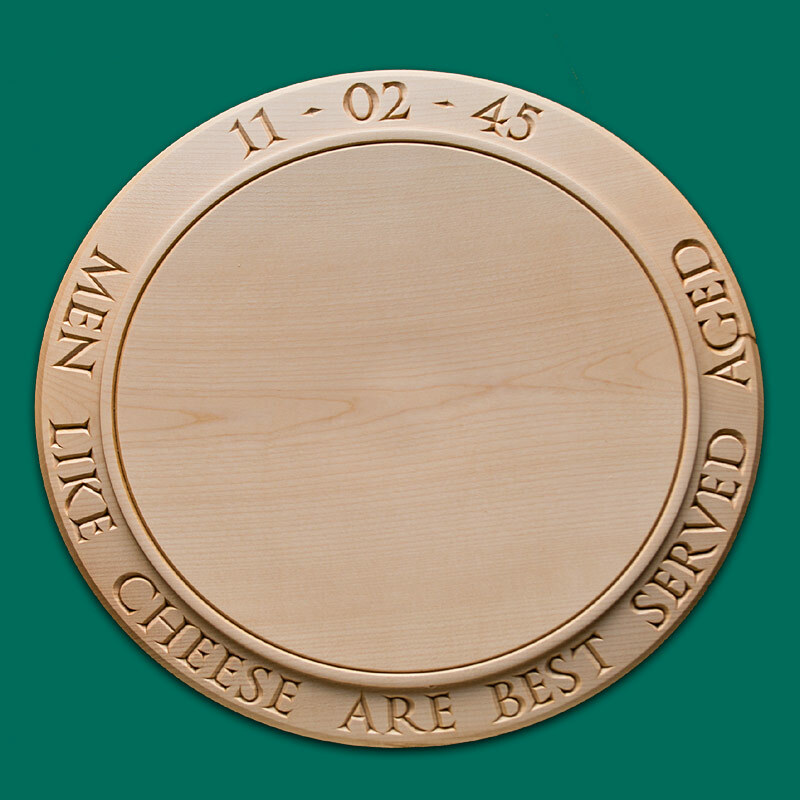 I also make larger cheese boards up to 18" across for couples that are having a "Cheese Wedding Cake" made from several cheeses instead of the usual cake option. Ideally I need to know the width of the largest base cheese, then I can make a board that is a perfect fit for your "cake", and carve and decorate the edges with an inscription of your choice.